Well, I never got around to updating this post with everything else last week as I still wasn’t feeling well. Still not 100% back to normal, but no fever finally. But definitely feeling better than last week. 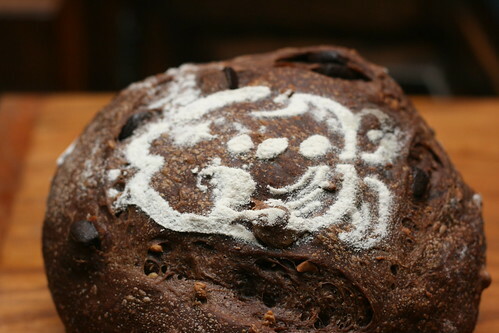 One thing I found while making this bread, pecan halves don’t distribute that well in dough, just like sliced almonds. So I’ve changed it to chopped pecans in the recipe. Of course, almonds would also be a good substitute in this recipe, as they go pretty well with cherries too. You can use any kind of cherry you want, different kinds will give a different overall feel to it (sweeter or richer). 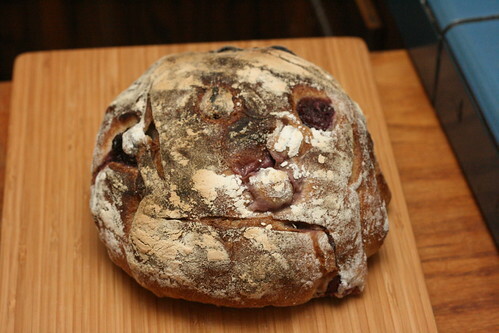 With the cherries being somewhat large pieces, this one tends more towards the Satsuma bread than the Pear bread. You get less frequent, but stronger hits of the fruit. While mulling on the idea of cinnamon swirl bread my mind drifted, as it tends to do, to chocolate and hazelnuts. I ate a square of gianduja, and kept mulling when it came to me, swirl bread with chocolate and hazelnuts! (Really, I’ll add them to pretty much anything I can…) So… chocolate and hazelnuts as the filling for the swirl, but I also made 2 doughs (one with some hazelnut flour and one with cocoa powder) and folded them into each other to try and get a marbling of the dough itself! 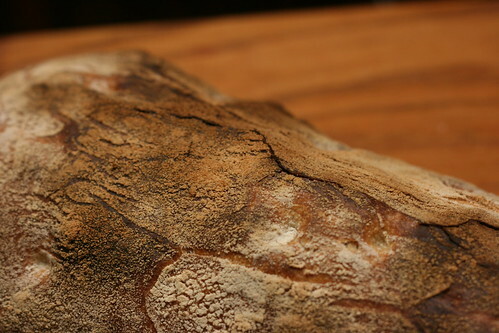 That didn’t turn out as visible on the inside as I would’ve hoped, but it gave the outside of the loaf an interesting appearance. 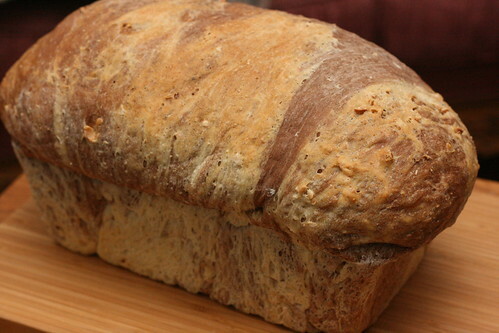 Funny story with this loaf… It was intended to be a loaf made of almost completely spelt flour. This was a great intention, until I went to the flour freezer and noticed the bag was mostly empty. Well, that wasn’t going to work. So I switched tracks and decided to throw in a whole bunch of flour types! I didn’t have much direction in exactly how much of any flour I added, I just went by feel … and how much was left in the bag! So even though it was a rather random assortment of flours, it turned out really yummy. 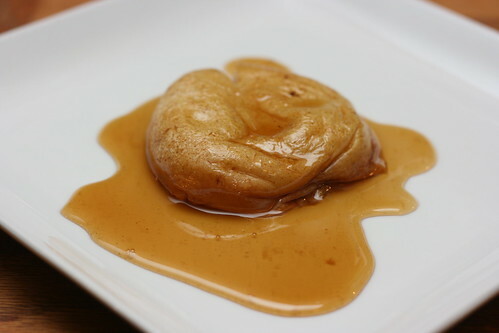 Some sweetness, and a lot of nuttiness in the flavor profile. 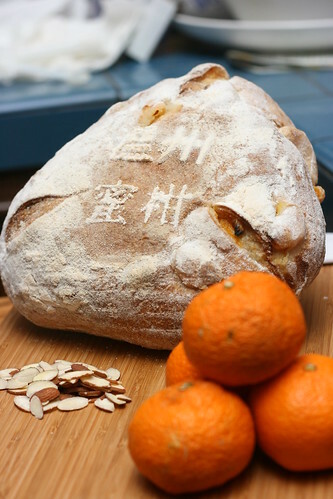 In my continuing quest to stick any fruit I can into a loaf of bread, I wanted to try adding some type of citrus to a loaf of bread. Pears, strawberries, and bananas worked, so why not right? I figured that if I left individual sections whole and was very gentle when handling the dough, they wouldn’t add too much excess moisture. That meant I needed to use a rather small citrus, and since I happened to have satsumas around they got the nod. I made from zest from them to put in the dough too, and used an orange olive oil so the bread itself would also carry a bit of the citrus flavor. 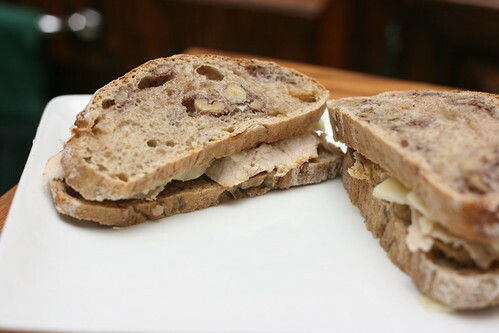 Almonds seem to pair the best with citrus to me, so I used some slices almonds in the loaves. In the future I don’t think I’ll use sliced almonds, they don’t distribute quite as evenly in the dough, live and learn! Although it may not have been readily apparent from this website, I am a chocolate fiend. If it is made from or with chocolate there is a good chance you can get me to try it. I like making chocolates truffles, filled chocolates, and chocolate desserts. I really prefer the term chocovore, to chocoholic… It isn’t that I’m addicted, it is more just that is what I was born to eat! Now, in addition to chocolate, I love hazelnuts. Coming to the natural conclusion here, I love gianduja, if you’ve never had it you should really do your best to find some and try it. Gianduja is a combination of finely ground hazelnuts and chocolate. I may or may not have a shrine to chocolate and hazelnuts in my closet. So, it’s the holiday season and everyone is busy, with work, shopping, making holiday goodies, etc. Not much time for making some normal everyday bread, right? Wrong! This dough is a bit tricky to work with if you’re not used to wet doughs, or if you really want to get your hands into it. But leave it alone, just giving it the minimum handling and it is easy as pie. 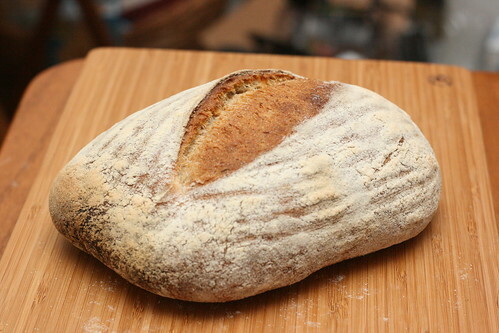 It is also pretty easy to make some minor changes to the recipe and give a whole different feel to the bread.